This popular Chinese cold dish is not only good for late night munchies, but also serves as a perfect beer food. The ingredients used were stewed in my reserved Shao Hsing rice wine sauce, so the base flavor was already well covered. To add even more punch to this cold dish, there were also homemade chili sauce for the spicy kick, aged black vinegar for a refreshing touch, and of course some freshly chopped scallion to brighten up all the heavy seasonings. Its Chinese name says it all, 攪和攪和, which literally means mixed up and stirred together. This is exactly how the dish was made. You take whatever cooked ingredients and mixed them up with all the flavorful Chinese seasonings. Let me show you the way I made the 攪和攪和. Bring a pot of water to a boil and add in the beef tripe. Bring to a boil again then drain out the water. This step is just for cleaning the tripe. Usually I would add some scallion and ginger slices in the water when preparing organs. However, the Shao Hsing base that will be used for cooking the tripe is already packed with flavors so I omit the aromatic ingredients here. Bring a small pot of Shao Hsing base to a boil. Add more water if not enough stew base is available. In that case, add one more stalk of scallion and a small chunk of ginger for more flavors. Bring to a boil then lower the heat to keep the pot simmer for about two hours. Make sure to scoop out brownish colored floating bits if there's any. Transfer the tripe to a cutting board and cut into thick strips once cool enough to handle by hand. 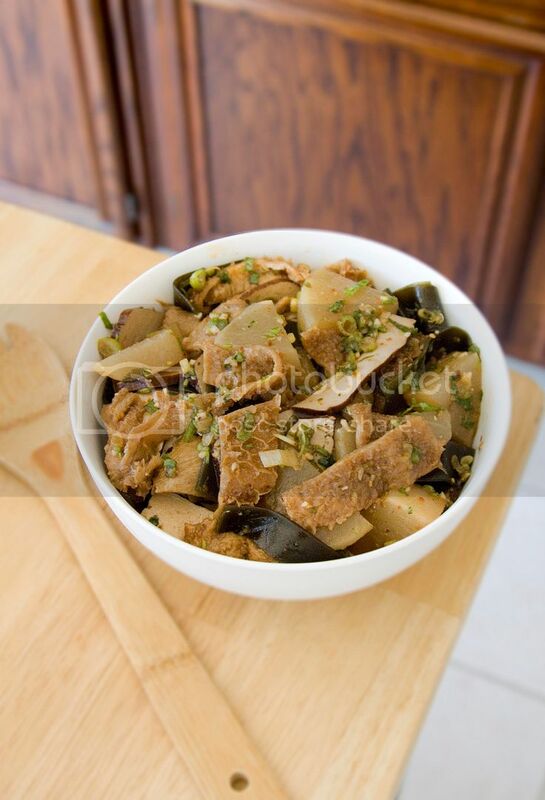 Chop the bean curd into strips and "clean" with boiling water just like the beef tripe. Drain well and transfer the bean curb into the stew base and cooked till desired texture. Took about 20 minutes for me. Transfer to a container for later use. Peel and chop the daikon into bite size chunks. Take a scissor and cut the kombu into strips. I cooked these two ingredients last in the stew base. The reason is that both of these ingredients take a while to turn soft. 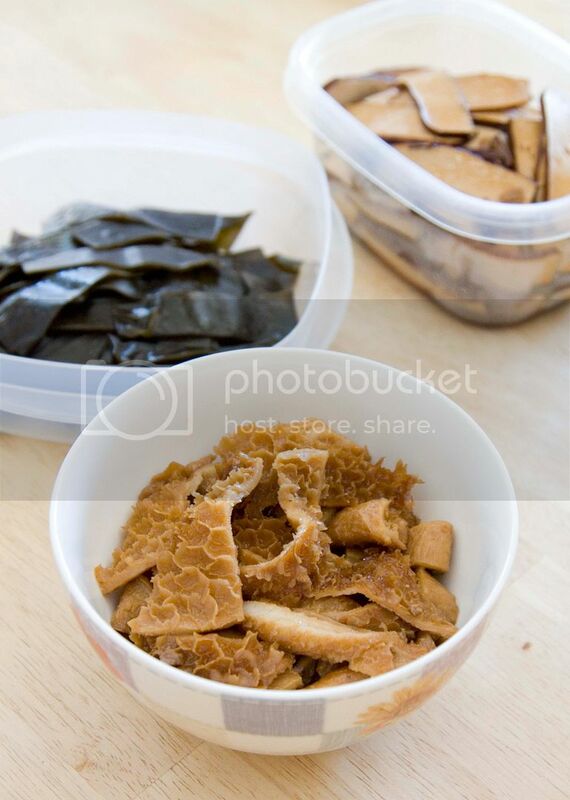 In addition, kombu tends to make the stew base sticky so it's better to cook the kombu in the end. Again, bring the pot to a boil then lower the heat to keep it simmer, about 2 to 3 hours or till the ingredients reach desired texture. Take a big container, add in some chopped scallion, chopped cilantro, peeled and finely chopped garlic cloves. Pour in some soy sauce and black vinegar. Drizzle just a little bit of black sesame oil. Add a spoonful of chili sauce and a pinch of granulated sugar. Mix well and give it a taste, see if more seasonings are needed. Don't be shy on the scallion and garlic, the more the merrier. There were at least 8 garlic cloves and 1 big stalk of scallion for this bowl of mixed up ingredients. As for the dressing, I used almost equal amount of soy sauce and black vinegar for a slightly sourish taste. Add in all the cooked ingredients and mix well. 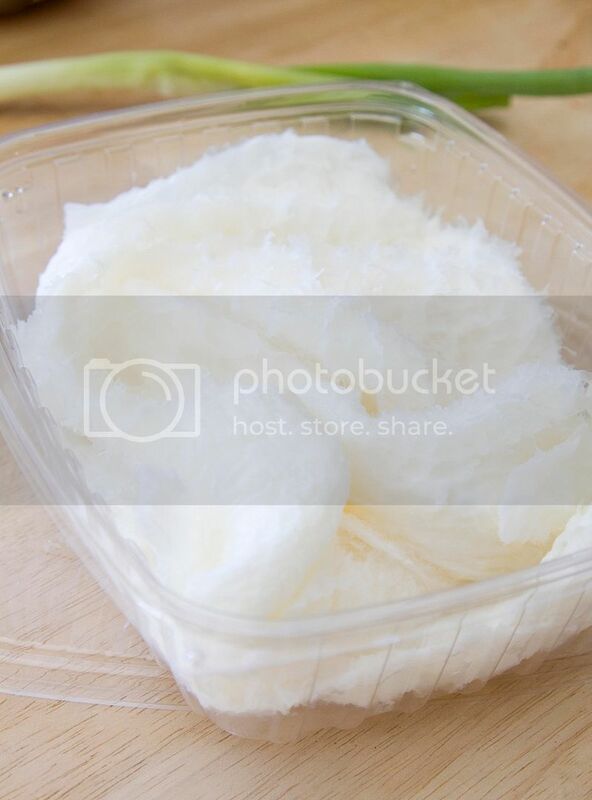 This dish can be served warm, but usually people like to eat it cold or in room temperature. 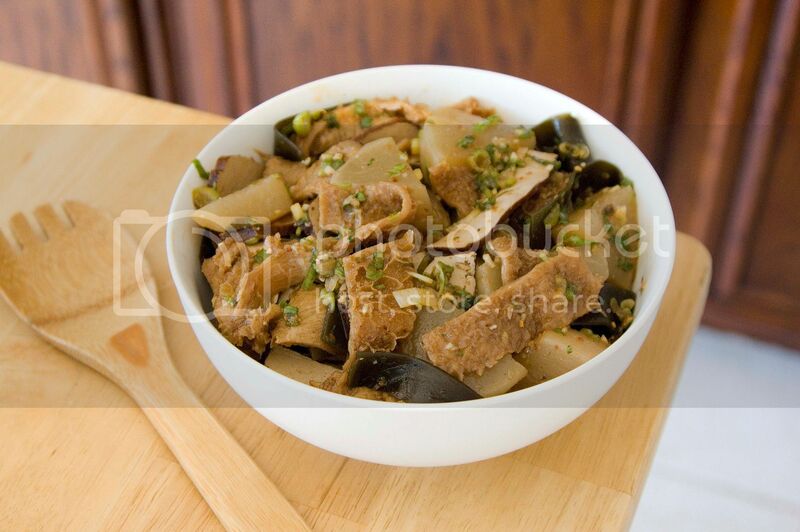 Besides eating as it is, this cold dish also serves as a good side dish with dry or soup noodles. Thank you so much! I'm glad you like the post/food!